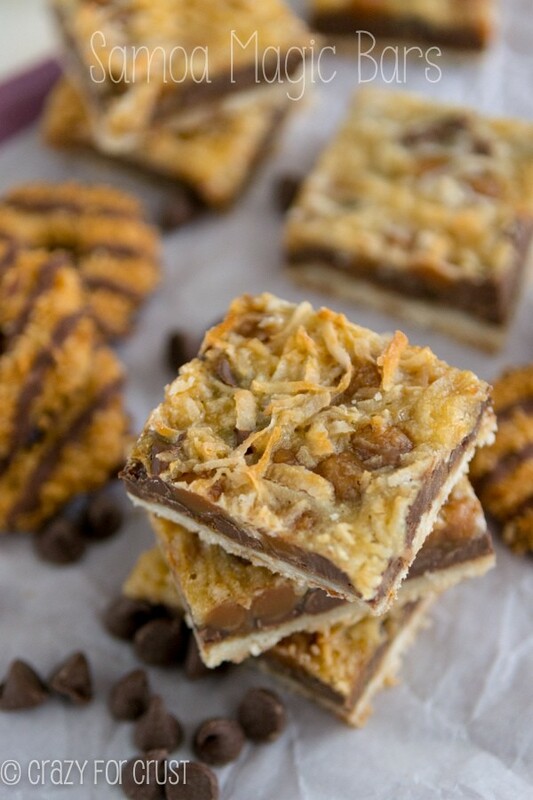 No actual Samoas were harmed in the making of these magic bars. 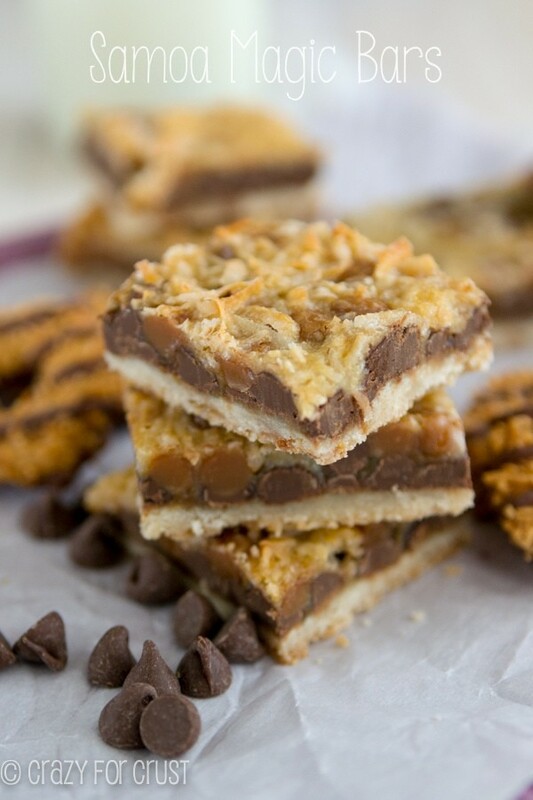 Samoa Magic Bars are inspired by the delicious Girl Scout Cookies, with a shortbread crust covered in a gooey chocolate, caramel, and coconut topping. If you run out of your favorite Girl Scout Cookies, these will hold you over until you can buy your Samoas next year! These Samoa Magic Bars just taste like the real thing…so you can have your magic bars and your Caramel deLites too! So, what are Girl Scout cookies up to now? $4.50 a pop? Seriously, they’re the only cookie that’ll I spend that much on for such a small box. I mean, each box is one serving (maybe two), am I right? Jordan was a Girl Scout for a hot minute back in Kindergarten and First Grade. By Christmastime in Second Grade she was hemming and hawing about continuing; it really wasn’t for her. So now we just live off the GS cookie stash in the freezer. You GS moms know it; it’s the one you have because your daughter had to get to the next tier so instead of paying your mortgage last January, you paid for cookies. Well, you’ll be delighted to know that these Samoa Magic Bars don’t actually use the girl scout cookies. So you can have them now, even if your shipment hasn’t come in. You can have them in June, when you’ve run out. Or you can make them AND eat that box of Caramel deLites. Whatever they’re called, they are the most wonderful combo ever: shortbread, caramel, coconut, and chocolate. To. Die. For. 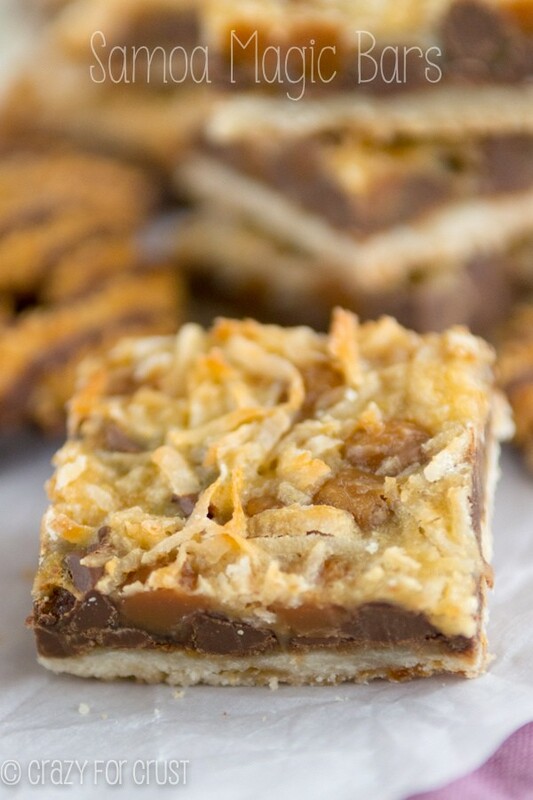 Samoa Magic Bars are like a homemade Samoa cookie bar with chocolate, caramel and coconut! I love making copycat Girl Scout cookie recipes because then I can have them all year long. Things like Tagalong Bars, Samoa Pies, or Thin Mint S’mores. My friend Averie makes a killer Samoa Pie recipe and Julianne has a Samoa Cake recipe that looks like heaven! 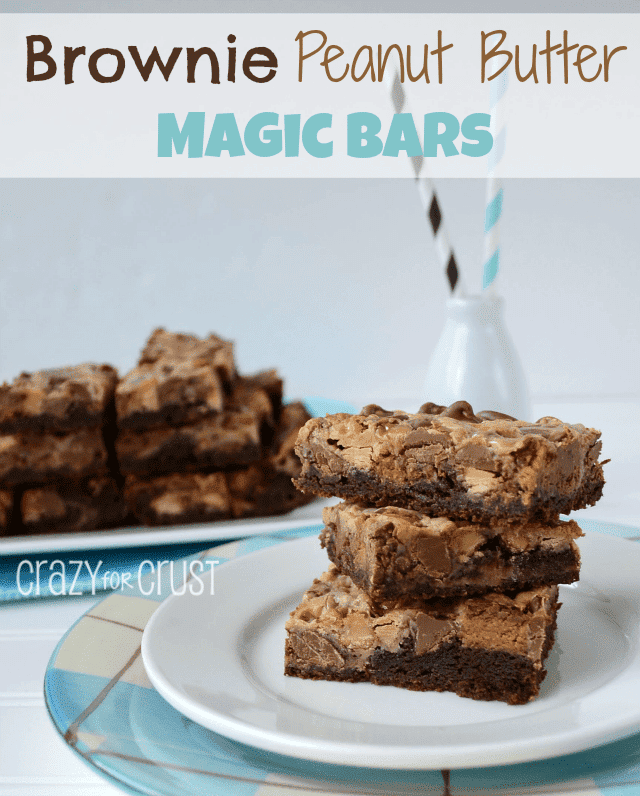 If you’re looking for a 7-layer bar without a graham cracker crust, these are the perfect magic cookie bars for you! These bars have a shortbread crust. It’s pre-baked for 10 minutes before you add the toppings. The toppings are reminiscent of that amazing girl scout cookie: chocolate chips, caramel bits, and coconut. I used Kraft Caramel Bits for my caramel layer. They’re little balls of caramel sold near the bags of caramel squares. 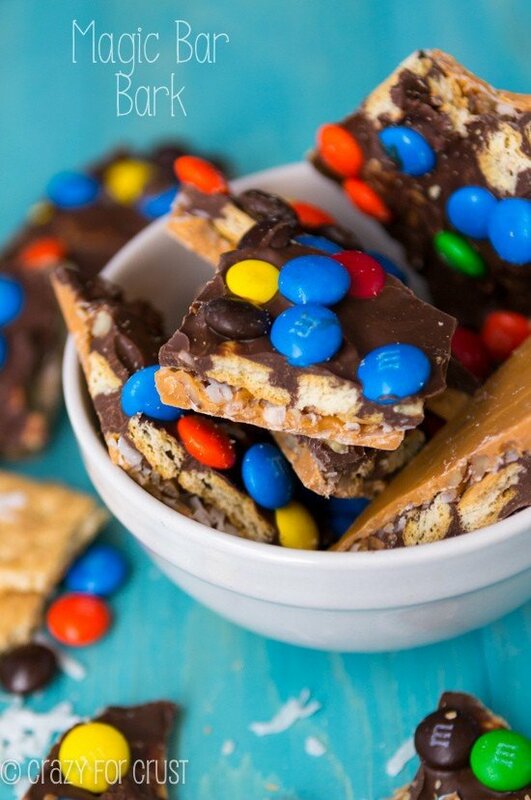 If you can’t find them, you can use caramel squares, or even Rolos. The magic comes from the sweetened condensed milk: you pour it over the top of the bars before baking and it melts all the goodness together. You’ll notice in the recipe I call for fat-free sweetened condensed milk. It’s what I prefer, but you can use regular as well. These are gooey, sweet, and they taste like Samoas! The perfect way to get your girl scout cookie fix…no matter what month it is! Oh, and these are, like, totally addicting. Beware! These are 7-layer bars without the graham cracker crust: I use a shortbread crust instead! It’s important to pre-bake the crust so that it’s not raw when you eat it. If you can’t find the caramel bits (I have good luck at Target), then use unwrapped caramel squares you cut in half, or use Rolos or another caramel candy. Sweetened condensed milk is the magic here; make sure you’re not using evaporated milk. They’re quite different! 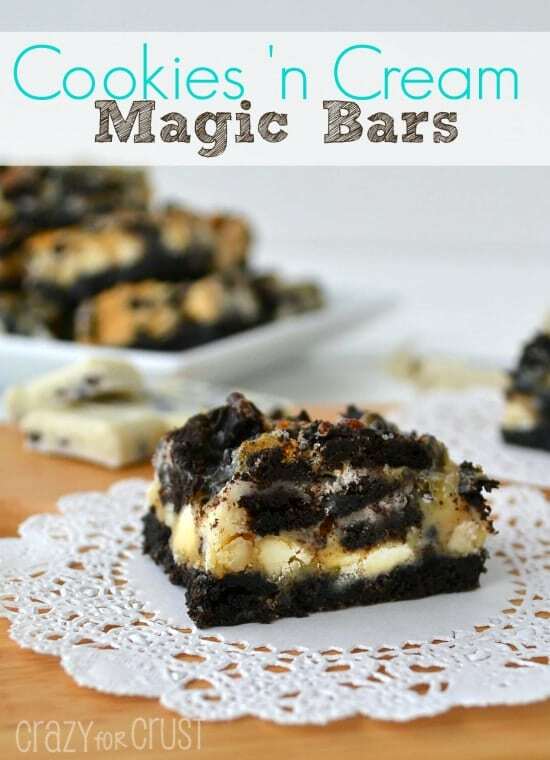 Turn Magic Bars into SAMOAS! Samoa Girl Scout Cookies are my favorite: shortbread, chocolate, caramel, and coconut. These Samoa Magic Bars are just like Samoa Cookies, but in magic bar form. Plus they're super easy to make! Line a 9x13” pan with foil and spray with cooking spray. The foil is optional, but helps aid in removing these from the pan. Press into the bottom of the prepared pan. Bake for 10 minutes. Remove hot crust from the oven and sprinkle with chocolate chips, coconut, and caramels1. Pour sweetened condensed milk evenly over the top. Bake for 25-30 minutes until golden around the edges. Cool completely before cutting. Store in an airtight container for up to 4 days. These can be frozen in a single layer in a resealable plastic bag or plastic container. Like Monica said: the difference in the names is due to the distributing bakers. Also: the main difference in taste between Samoas and Caramel deLites is the chocolate! Samoas use dark chocolate and Caramel deLites use milk chocolate! Don’t forget to add the coconut! It is there. Did not forget. I know. Lol. I just said that because I reallllly love coconut! Don’t forget to add coconut! Can you use caramel ice cream topping from a jar ?